At locations throughout downtown, Victorian singers, bagpipers, brass bands and strolling minstrels provide warm Christmas music. Nevada City’s famous Walking Christmas Tree can be found, along with hot roasted chestnuts and horse-drawn carriage rides. Get your picture taken with Santa Claus! $6 for one or two for $10. Santa is in the Old Firehouse at the top of Broad Street. The Broad Street Overpass is for bus loading and unloading only. No bus parking on the overpass!! 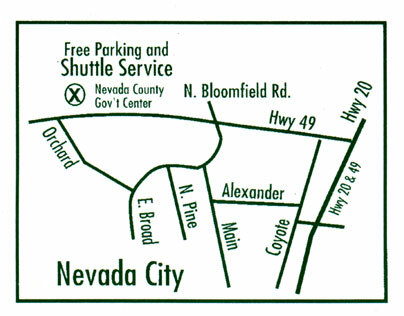 Bus parking is available on Coyote Street and will be clearly marked!